Follow this basic recipe to make ahead and freeze Crustless Quiche. It’s the basic template and process we used at our Make Ahead Meal Prep store for years! Leave the crust off for a low-carb, ketogenic and gluten-free meal. We’ll show you how to make substitutions to this Crustless Ham and Cheese Quiche recipe and answer all your questions! Pictured is Crustless Ham and Cheese Quiche. It’s quite similar in appearance to Crustless Asparagus Quiche and Tomato Bacon Quiche. That’s because these recipes use the same easy formula. Even Ham Quiche Cups use this basic template. Read on for the tried and true process, the easy substitution formula and, of course, lots of tips! Crustless Quiche is essentially the filling for any quiche baked without a crust in a pan. So long as the filling cooks nicely in a crust, there should be no problem cooking it without a crust. Here’s a breakdown our recipe. This recipe calls for a 5 to 1 ratio of large eggs to milk. 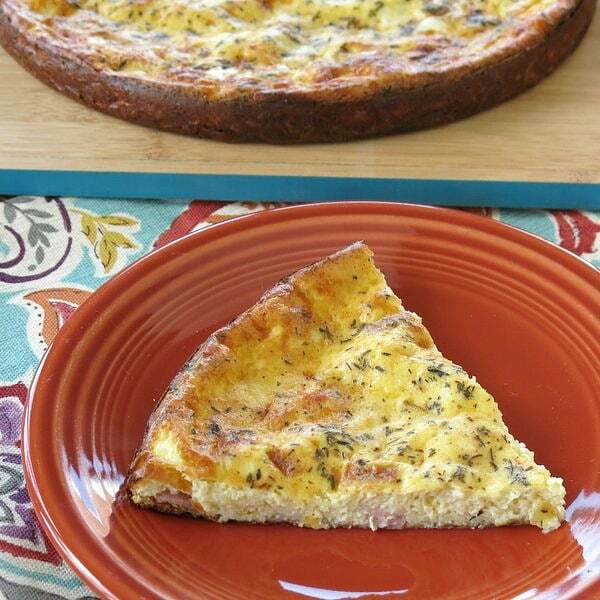 If using extra large eggs, then using a 4 to 1 ratio will result in a denser quiche. Gently whisk the eggs. We use whole milk. However, skim milk, half and half and heavy cream work too. The higher the milk fat, the creamier the finished dish will be. Shredded cheese is added next (about 1 cup.) 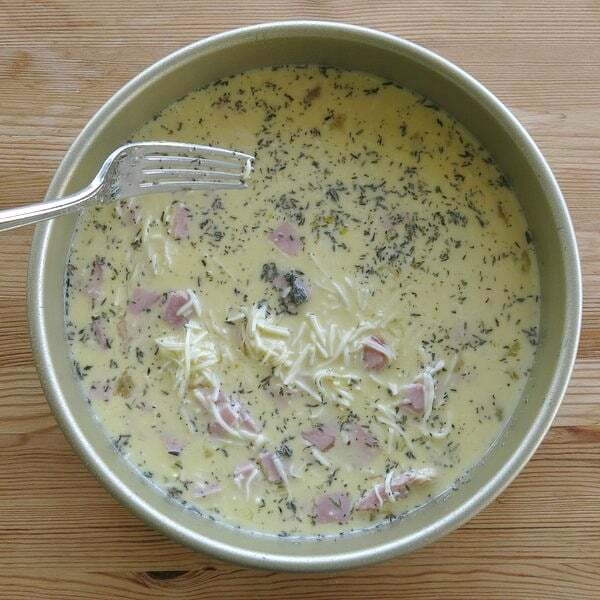 Swiss cheese is frequently used in egg recipes. But, other types, such as cheddar or Colby jack will work just as well. It’s a matter of taste. I personally find that mellow cheeses, such as mozzarella don’t add much to the overall taste. Finally, add meat and vegetables (about 1 and 1/2 cups) and the appropriate spices. When creating your own recipe, we suggest adding 1/4 teaspoon salt, 1/8 teaspoon pepper and something else, like thyme or basil, for the initial test. We’ve included the substitutions to make quiche lorraine and quiche florentine below. Combine everything in a large bowl and then pour the mixture into a round pan coated to prevent sticking. Very important step: Use a fork to evenly distribute the contents in the pan. In the picture below, the cheese and ham are clumped together. Bake the quiche in a 350 degree Fahrenheit oven for 50-60 minutes or until a knife inserted comes out clean. Allow the quiche to set for another 10-15 minutes before removing it from the pan. If the quiche begins to brown too quickly, but is not ready to come out of the oven, cover it with a piece of aluminum foil. Note that the same exact process is followed to cook the quiche filling in a prepared crust. Many different pan types and sizes become options when a prepared crust is not used. The quiche pictured is in a 9 inch round aluminum pan. An 8 inch round pan would make it a little thicker. 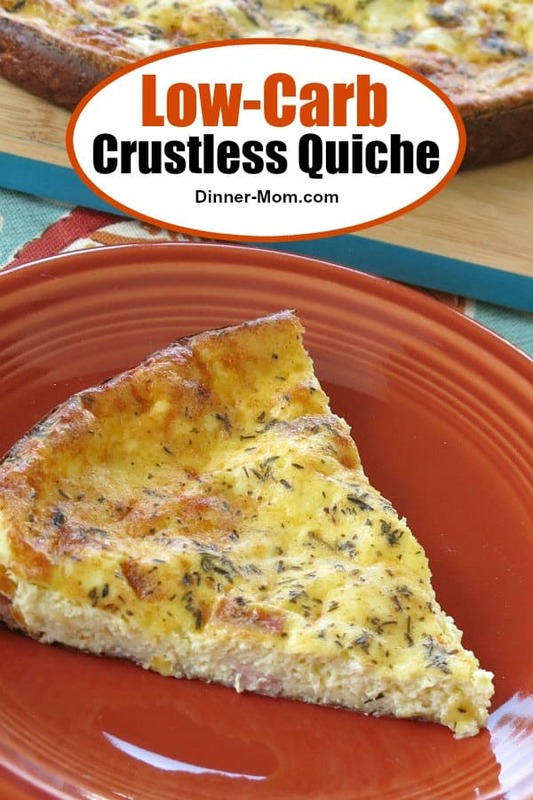 This recipe is easily adapted for muffin tins or even mini muffin tins to make mini crustless quiches. A spring-form pan, brownie pan, and even a glass pan will work. The cook time will vary based on the type of pan used. Quiche may be frozen before or after cooking. Once you have the ingredients prepped it’s very easy to assemble several bags. If the quiche will ultimately cook in a crust, then we recommend freezing only the filling. To freeze the filling before cooking, add the prepped ingredients to a gallon ziplock bag, seal the bag and gently shake to mix. Open a corner of the bag and remove any excess air and then seal. Freeze flat for quick defrosting and easy storage. Thaw the quiche filling in the refrigerator for about 24 hours and then cook according to the directions. Quiche may also be frozen after it’s cooked. Consider cutting the quiche into slices and individually enclose in plastic wrap. When ready to cook, microwave from frozen on high at 30 seconds intervals (about 1 minute) until heated through. If reheating an entire quiche, then place the cooked quiche in an ovenproof dish, such as the one it was originally cooked in, and heat in a 350 degree F oven for about 20 minutes, covering with aluminum foil to prevent burning. Use any combination of up to 1-1/2 cups of meat and/or vegetables and about 1 cup of cheese. Adjust the seasonings too. Quiche Lorraine – replace ham with bacon and add about 1/2 cup of diced onion. Replace thyme with 1/8 teaspoon of nutmeg. Quiche Florentine – replace ham with chopped spinach (well drained) and add diced onion (about 1/2 cup) and use 1/8 teaspoon of nutmeg instead of thyme. Other mix-ins: Sausage, Canadian bacon, spinach, mushrooms, tomatoes, and asparagus. Follow this basic recipe to make ahead and freeze Crustless Quiche. Prepare the ingredients as indicated before beginning assembly. Add all ingredients to a ziplock bag (or bowl if you will be cooking right away) and combine. Follow the Cooking Instructions below to cook right away. To freeze, seal ziplock bag, removing excess air. 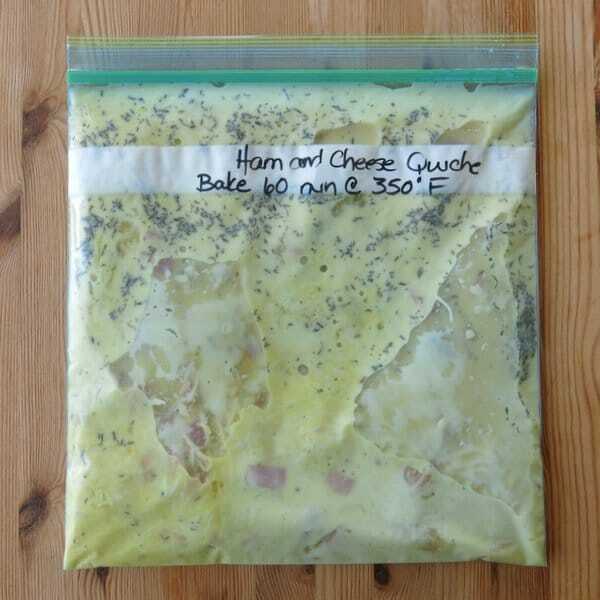 Print the Recipe/Cooking instructions and place it between the two bags so the cooking instructions are handy when you are ready to cook the quiche. Store in a flat position to minimize the defrost time and for easy storage. 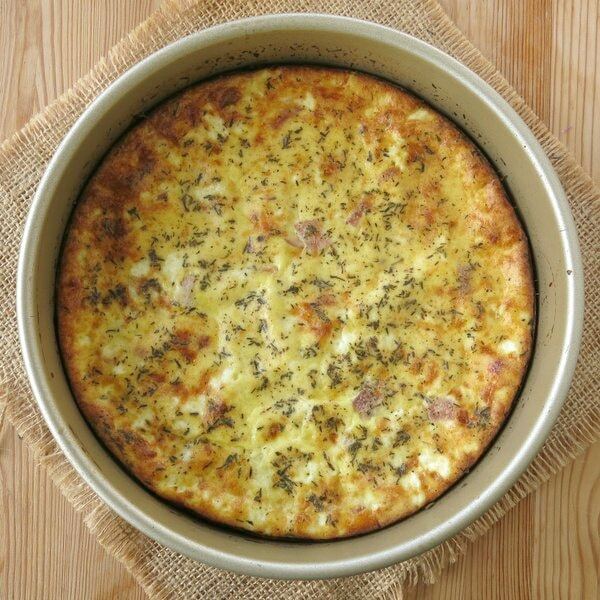 Thaw quiche in refrigerator for 24-36 hours, if frozen. Gently distribute egg mixture with fork. Bake uncovered for approx. 60-70 minutes or until an inserted knife comes out clean. The top should be lightly brown and will continue to set after removed from the oven. Allow quiche to sit for 10-15 minutes before cutting. Internal temperature should reach 160F. Hi! I would switch to a cheddar cheese. Keep the salt and pepper. Or, add a pinch of nutmeg. Let me know how it turns out! Have you cooked the quiche and then frozen it? How does it turn out? Suggestions for reheating to eat? Thanks, glad to find your site. However I would be using a conventional oven, not microwave. You can absolutely reheat in a regular oven or toaster oven. I’m not exactly sure how long it will take so keep an eye on it. Cover with aluminum foil to prevent the top from burning. Try cooking for about 15 minutes in a 350 F oven. Thanks for reading! 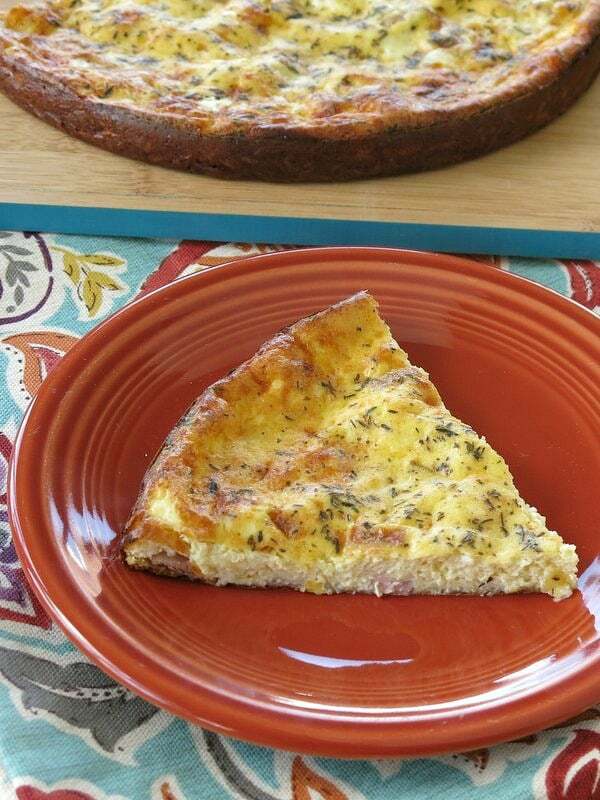 This crustless quiche is such a great way to use up leftover holiday ham! I love anything I can make ahead and freeze for later. Definitely adding this to my list of must tries! Hi. I really to make this for my mom who’s recovering from surgery but I have a few questions: 1) If you use bacon, do you cook it first and then add to the Ziploc mixture? 2) Is it best to cook in a pan from Ziploc mixture, or should I bake first then freeze? 3) Can you bake the mixture in a cast-iron skillet? Hi! 1) Yes – cook the bacon first. 2) You can absolutely do it either way. Freeze it cooked if you want the convenience of heating slices up in the microwave. 3) I have never done this before, but it should work like a fritatta. Hope this helps and wishing a speedy recovery.